I was very much struck by this passage which I read in the NY Times today. The text was in a column by a “Joe Drape,” and his basic thesis was and is that the sport is pretty dead. No surprise, this angle. The easiest way to get a boxing story placed in the NYT is to have the focus be on a pugilistic tragedy, or an ex champ down on his luck or the like. I doubt that it enters the mind of the editors there that boxing is feeling a similar pain to the aches, deep and sharp, felt by those in the newspaper business. I read not long ago the paper is looking to shrink their workforce more, taking down head-count by asking for people willing to take a buyout. This is being done in order to be nimble and be lean and mean and such. Boxing is now lean and not as mean, one can argue. The PBC push hasn’t resulted in a magnet effect, with an obvious eyeballs-ballooning, and there haven’t been much in the way of ratings wins in the last year plus to point to suggest that an optimistic assessment of the overall vitality of the sport is called for. HBO has cut budget, by what percentage it isn’t clear, though Showtime, it must be said, has been investing continually into the sport. 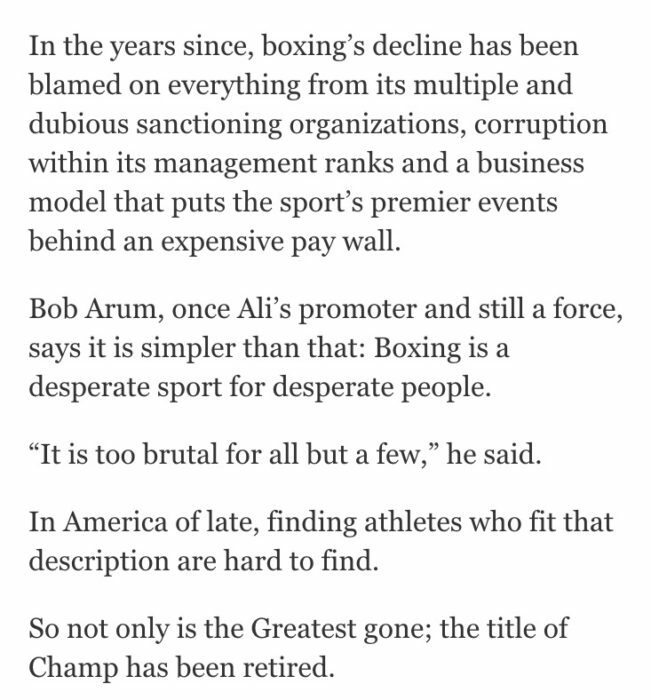 I was chewing on the passage below, a quote from Bob Arum. “(The sport) is too brutal for all but a few,” the promoter said. The title of “Champ,” Drape writes, has been retired. The sport is not in a Golden Age and I don’t pretend to know if it will enjoy another. I think Arum has a point, and to bring it a step further, believe that society has “progressed” to a point where the knowledge of brain trauma’s effect on those partaking in collision sports places a burden of conscience on those tempted to partake in watching them for entertainment purposes. Of course, the previous paragraph in the Drape piece, which mentions the limiting factor of placing the best fare behind a pay wall as the sport seeks to gain market share in the youthful demo which grew up expecting “free,” has to claim some credit for limiting eyeball growth the last 25 years. I do think a big fat IF has to be thrown out there. If another Tysonesque sort is punishing a heavy bag somewhere and will soon be unleashed on the trembling and curious and then enthralled customers, all this talk will be shelved. Lord knows, there is no shortage of have nots in regions untouched by prosperity who might find this same pathway that has led to a way out, for a hundred years or so. A “Champ” is out there, I declare, even if the Times doesn’t see that belief as fit to print.